EXCLUSIVELY AT NEIMAN MARCUS Lined drapery panel. 3" rod pocket and back tab. Sold as a pair. Polyester; dry clean. EXCLUSIVELY AT NEIMAN MARCUS Curtain panel in abstract swirl design. Fully lined. 6" rod pocket. 96"L x 52"W. Sold individually. 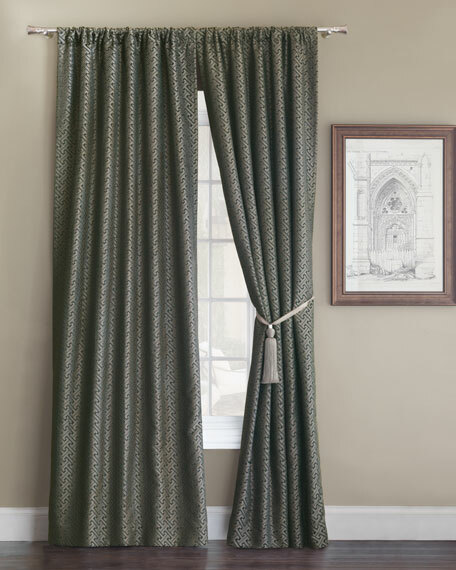 EXCLUSIVELY AT NEIMAN MARCUS Drapery panel curtains in metallic printed velvet. Rod pocket; lined. Made of cotton/viscose. Machine wash. Each curtain is approximately 52"W x 120"L. Imported.